Delightfully, I’ve been seeing lots of Tiger Swallowtails lately! Here in New England, Tiger Swallowtails are one of our largest and most beautiful butterflies. There are abundant sources of food for both larva and adults, so this species is thriving throughout its range from the East Coast to the Rockies. Click the above link to learn more, see what the the larva look like and host plants used throughout their life cycle. This one is sipping from a wild honeysuckle bush (Lonicera tatarica), which is considered an invasive species, but many insects and birds have adapted to what they offer. 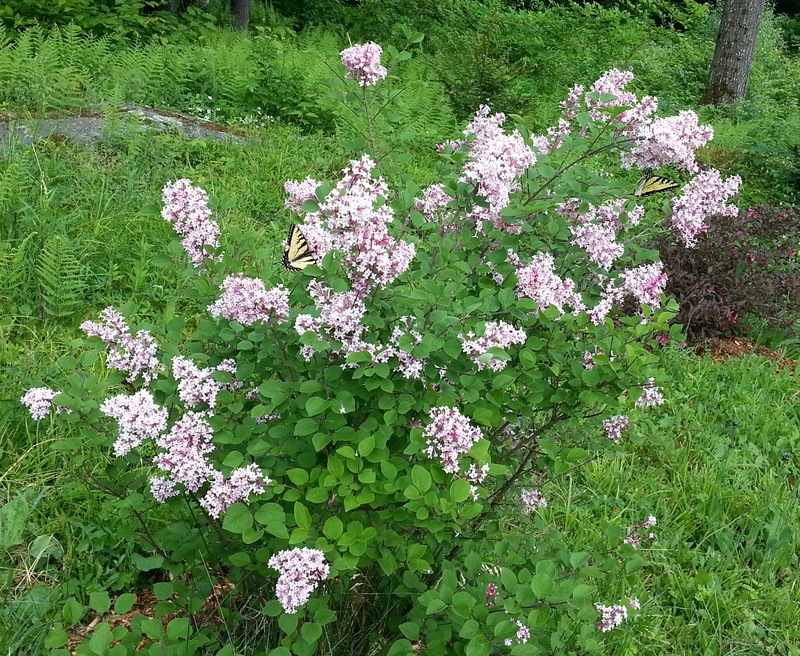 Below are a pair sipping the blossoms of my sister’s Korean Lilac (Syringa meyeri). Adult wingspan measures 2.5 to 4.5 inches. They are amazing gifts of Nature! Image | This entry was posted in Field Notes, My Photos and tagged conservation, Eastern Tiger Swallowtail butterfly, host plants, Larva, nature, photography. Bookmark the permalink. Wow, that’s a big and beautiful butterfly! I can only imagine a woods full them – like a Disney movie. Ha! Yes, like a Disney movie! And just as magical! Beauty like this is what makes us appreciate nature even more. What a fabulous butterfly Eliza and your photo surely catches all its radiance. Thanks, Dor, for your kind comment. Hope all is well with you today. I don’t think I’ve ever seen one of those here in Maine. Or I’ve just never taken notice of them. Thank you! The larvae feed on deciduous trees. I know there are lots of conifers in Maine, so that may be why? It has got to be one of the most beautiful butterflies! It is quite beautiful and we’re not even in the tropics! I look at these pictures and all I see is true perfection. Thanks. Nature really knows how to do it! That is indeed a beautiful butterfly. Fascinating isn’t it that nature creates those patterns to frighten away potential adversaries! Yes, the complexities of nature never cease to fascinate me. Thank you for your visit. What a lovely image, Eliza. We get lots of swallowtails and I just love them. Nothing is more peaceful than seeing one float through the garden………..